For the alphabet 'W', we can choose a city from any country we haven't cooked any dish so far. So, i went ahead and chose Wangerooge from Germany. Wangerooge is one of the East Frisian Islands. It is the easternmost and smallest of the inhabited islands. The island is attractive to tourists due to the beaches, various recreation facilities and its relaxed atmosphere. The island's slogan, visible on a sign at the harbor, emphasizes this: "God created time, but he never mentioned haste." To keep their island calm and fitting place to their slogan, it is a car-free island. The island can be reached by Ship or plane and a railway line connects the harbor and the main village.Looks like a dream for me, as i read that information. A Car-free island, greenery everywhere and a slogan that says Enjoy life in its own pace!!! Wow, a definite place to visit!! I chose to bake German potato bread, where a part of flour is replaced with potatoes. We loved this bread, it came so soft and fluffy. As usual, my Lil one, the taste-tester of my recipes, couldn't wait until i can click a decent picture of the bread, he was jumping by the side of the table and i was repeatedly asking him to wait for 2 minutes, till i finish clicking!!! Tough job, hmm, but then i love it!!! Wash and peel the potato and cut into 6 cubes. Cook them until soft. Let it cool completely. Drain and keep the water aside for kneading the read. Mash the potato fine. Now add the flour, yeast and salt to this and start kneading to make a soft dough. While kneading add water and oil slowly and knead the dough. Water used to knead the dough should be Warm. Remember very hot or cold water will kill the yeast. When i say warm, i mean warm enough to touch, the water that is still hot but wouldn't scald your hand when touched. 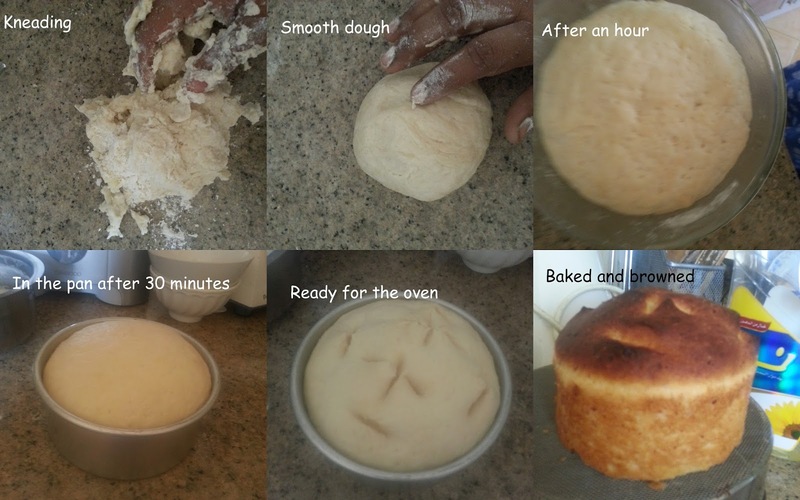 Once the dough holds a ball shape, take it to a flat kneading surface, i used my kitchen counter, Knead around 5-8 minutes to get a smooth, baby-bottomy dough. Let the dough rest in a wel-oiled bowl for an hour or unitl it doubles. Once it doubles, transfer the dough into a well flourd kneading surface. Punch it down and shape it loosely into a ball. Do not handle the dough hard, just loosely roll it into a ball. Grease a baking pan with oil or line a parchment. place the ball of dough into it and let it sit for another 30 minutes. Preheat the oven to 220 C, using a scissor just make small cuts on top of the bread. Do not make deep cuts, bake the bread for 30 minutes or until the top is well browned. Take it out of the oven, remove the bread to a wire rack, let it cool completely. Slice and serve with cheese or butter. Aw..I love that last click of LO holding on to that soft and spongy bread..it looks wonderful. Kudos Priya. .you have been posting amazing breads. Another lovely bread baked to golden brown perfection. Lovely bread, Priya! Love the cute picture of your son!! Wow, thats a beautiful bread, lovely crust with beautiful crumb, looks amazing Priya. Wow, that is one amazing potato bread. Came out just perfect. Love the texture of that bread. It has come out so well. wow thats a perfectly baked fantastic bread from german :) amazing they look!! Lovely bread.. Came out deliciously good. Mmmmmmmmmmmmmm! Love it and love the pic of kiddo enjoying it. I am so tempeted to just get up now and make it but its late so postpones now.